"If you love chocolate and cream cheese, you'll love these cookies. At little goes a long way. Make them small, they do not spread." In large bowl, cream together butter, brown sugar, and white sugar until smooth. Beat in cream cheese, egg, and vanilla. Combine flour, baking powder, and salt; mix into creamed mixture to form a soft dough. Fold in the melted chocolate until the dough is just marbled. Do not over mix. Drop dough by heaping teaspoons onto ungreased cookie sheets. Cookies should be about 2 inches apart. Bake for 10 to 12 minutes in the preheated oven, or until edges are light golden brown. Cool completely before storing. These just tasted like brownies. And, if you don't wait long enough for the chocolate to cool you will not get the "swirled" effect. Quick and very good. 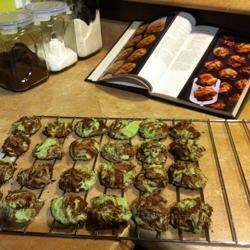 I used Ghirardelli chocolate chips.. very rich and delicious! No weak flavor here. Look great, but just so-so. I expected more flavor and really have no idea what to add that could make this better. Not going to make these again. These cookies, while quite nice looking, were just ok. I think they needed more chocolate flavor. I am giving this recipe four stars because the texture was awesome, it was just lacking flavor. My family loves these-- they disappear within the day that they are made! One of the best cookies I've ever had and they are even better frozen!